When I started collecting Hamiltons one of my first lucky acquisitions was a black dialed Brandon. As I learned more about the CLD line, I realized there were 19 different models in the line up, even more if you considered dial color and case variations. So there are well over 25 CLD examples to obtain if you wanted a complete collection. After getting about half of them I realized the remaining watches were uber-rare and solid gold - too factors that mean "really expensive" and not likely purchases for me. So I threw in the towel. But if you're inclined to give it a shot, here's what you need to find... up until now I had found all but three. I have seen K-200's for sale but haven't landed one personally. So I know they are out there. I have never seen a Tildon for sale. Sometimes you'll see the 1951 Scott mistakenly identified as a Tildon, but it remains elusive. I did finally land a Lange recently. I think over the past 5 or 6 years I have seen maybe four Langes - so they're surprisingly uncommon. 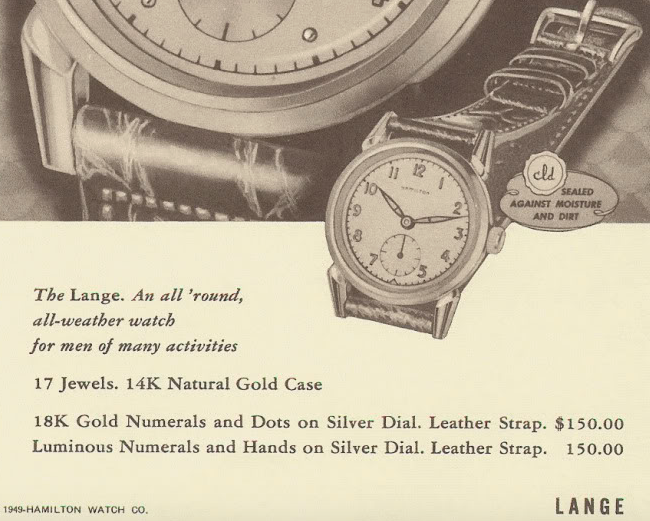 The Lange was introduced in 1949 and produced through 1952. It looks identical to the 1948 Langdon but it's solid 14K gold and not 14K gold filled. Tucked inside the Lange is an 8/0 sized 747 movement. Two dial options were available; a butler finished AGN dial or a luminous dial. Sometimes the dial says CLD and sometimes not. My project watch arrived in typical beater fashion but I jumped at the chance to buy it and I was surprised that I wasn't out-sniped. This is a VERY hard model to find and if you don't agree, as they say on Antiques Roadshow, "try to find another". The Lange case is virtually identical to the Langdon - which is easy find - so you have to look closely to see whether it's solid gold or gold filled. No denying this is a Lange. The dial is very grungy but I'd give myself a 50:50 chance that it will clean up nicely. You never know until you try and I know I can get it redone to look like new if I screw up. Well, if the outside of the case didn't convince you this is a Lange, then the inside of the case sure should... the name is right inside. I wonder if I sent this watch to Quantico if the FBI could tell me the original owner, as there's a big ol' fingerprint on the ratchet wheel. The movement is dirty but I'm sure it will clean up nicely. Everything cleaned up nicely except the dial. The grime wouldn't budge so I will have to send it out to be redone. Initially running a little fast, a quick adjustment to the regulator slowed the watch down to 3 seconds fast per day. Amplitude is well above 200 and the beat error is on the higher side of acceptable. A new crystal and vintage croc strap do a lot to improve the looks of this watch but no lipstick will make this pig-dial pretty. Once the dial is refinished this watch will look awesome. So be sure to check out this post in a month or so for an update. Here's a photo of the Lange with a refinished dial... a huge improvement I think. With the vintage croc strap this watch looks like it's brand new! Dan, just want to take the first day of the New Year to wish you the best and to thank you for your blog and its considerable contribution to the Hamilton horological community. Thanks - it's a labor of love. I walk in the footsteps of others who are equally generous with sharing their knowledge. I'm just a paying it forward. I think I have a 1952 Lange. Could you help me confirm this identification and maybe with appraisal?? It's rather easy to identify - if it looks like the above and says 14K Gold then it's a Lange. If it doesn't say 14K Gold then it's a Langdon. I don't do appraisals but a nice Lange is a $500+ watch in my opinion, maybe more if it's super-nice. Less if it's in need of restoration, like what I started with. Dan I'm learning to do service but Iv not there yet. Do you service any other brands? Sometimes... I've done several other brands but you often need mainsprings, stems or even screws and I don't have a hoard of parts like I do for Hamiltons. I chose to focus only on one brand and why not make it the best one? Ha ha! Good luck with the learning curve, you'll get there!